The EC1 is our first product aimed at the non-industrial users. It is also our first 32-bit off the shelf microcontroller board (we routinely make custom 32-bit SPLat controllers). Every unit ever shipped from us is 100% tested. The EC1 is warranted against manufacturing defects for 2 years from its serial number date, just like all SPLat made products. If you blow it up you are not covered. Also, our Post Nuke repair policy does not apply to this product. "When we started down the path to develop our new appliance, we knew we wanted the power and flexibility that a programmable controller would give us. After evaluating several options, we chose a custom SPLat controller. From day one, SPLat Controls established an excellent understanding of our needs and delivered an outstanding product perfectly suited to the specific requirements of our appliance. We consider SPLat Controls to be a partner rather than a supplier." Let's get to this straight off! The EC1 is not intended as a competitor to the Arduino in the hobby field. Rather, it is intended as a very low cost alternative to SPLat's industrial quality controllers. You can buy an EC1 for less than $30 and start exploring concepts for controlling your product. When things are looking good you can then transfer to our industrial grade products or have us make a custom SPLat for you, and everything you learned with the EC1, including program code, can be brought across to a final solution. 32 processors for the price of one? Imagine a board that lets you write 32 separate, completely independent programs, and have them running simultaneously! That's what you get with the EC1 (and all SPLat controllers). You could, quite literally, have one EC1 control your aquarium, your blinds and your garage door at the same time, with your smartphone as the user interface. In reality, any non-trivial single control application needs to be able to do several things at once — just your aquarium, for example, needs to cycle the pump, control the temperature, time the lights, and monitor pH and salinity, all at the same time as interacting with a user interface. Now, multitasking is not something new. Embedded controls professional have been using real time multitasking operating systems (RTOS) for years. However, they are difficult to use, and error prone. Billion dollar space launches have failed because of programming errors around RTOS usage. What's different, and unique, about MultiTrack is that it is an integral part of the SPLat language, deeply embedded in the SPLat Virtual Machine, and extremely easy to use. It is so easy to use that you need to learn only two instructions to use it, and the concept behind it is so easy to understand that we introduce it in the first programming EasyStep (more on EasySteps below). In all other systems, the multitasking is done by an RTOS that is distinctly separate from the language. For example, C/C++ not only have no intrinsic multitasking, they don't even directly support physical inputs and outputs. All that stuff comes from bolt-ons. News: EC1 now supports 64 simultaneous tasks! More on real time operating systems. The EC1 has been designed to allow you to experiment and quickly explore various ideas. External connections are via simple pins, which will accept jumper leads obtainable from Amazon and elsewhere. This makes it dead easy to hook up external circuitry on a solderless breadboard. It has a red and a green LED and a push button switch, so you can even interact with it even without anything connected. We have eliminated the need for a programming cable, so as with an Arduino you just connect to a computer via a mini-B USB cable, and it will get its power from the USB. You can even program it on a plane. We intend to develop a number of projects around the EC1. In the main these will be simple, easily understood examples of adding external interface circuitry. We will also do "how to" pages for cheap, readily available 3rd party add-on modules like proximity detectors, relays, joy sticks, Bluetooth and more. But as ideas arise we will do complete fun projects as well - we also like to do things just for fun sometimes! A comfortable cow is a happy cow - A happy cow makes more milk. One way to make dairy cows happy is to provide a comfortable environment. SPLat helps AutoVent LLC do just that for their customers. The EC1 is cheap because it is really "stripped for racing". Unlike its industrial strength SPLat siblings, it has a naked processor chip. So just like the Arduino it has no surrounding circuitry to interface it to the real world of industrial sensors, relays, solenoids and the like. You can add that yourself (and we will be showing you easy ways to do that). But with its 72MHz 32-bit processor the EC1 will race! Early indications are it will be at least 10 times faster than its 8-bit siblings such as CC18. Just for hobbyists? Jim disagrees! First of all let me tell you that I have used a few of the SPLat controllers for special projects and I am a fan both of the hardware and the SPLat development platform. I am an electrical engineer by training and an engineering manager by trade. I have managed many many embedded system based developments over the last 30 years, with small systems using the PIC micro controllers and the larger ones using an assortment of 16 and 32 bit controllers. I can say that most, if not all, needed a custom I/O design to handle the various input and drive requirements (H drives, PWM, complex analog inputs etc.). As you well know, as the systems became more complex the challenge to create reliable firmware grew exponentially. Timelines and development costs were fairly simple to keep in line except code development and reliability testing. Why am I going into this detail? Because I think the real use for the EC1 is as an off-the-shelf embedded core for designers that know they will need to design a custom I/O system, no matter what. While your products like the CC18 are more robust than many options, most users will need a custom I/O anyway, so why not just start with EC1? I know I would have opted for it for many designs just so our team of programmers could get away from RTOS based designs using C++ that were always over budget, late and full for hidden bugs. You guys are amazing and I do not think the EC1 will be mainly for the hobby market. Just my 2 cents. The EC1 is programmed using the SPLat language. If you are familiar with SPLat, you can use your existing knowledge. If you are new to SPLat, the language has been designed specifically for logic control programming (unlike C/C++, which is the language underlying Arduino's "sketches"). It has built in multitasking (lacking in Arduino) called MultiTrack™. That may seem like something rather esoteric if you are a newbie, but it becomes significant very quickly once you start trying to make your controller manage several activities at once. MultiTrack™ makes it the EasyOne for multitasking. More on multitasking. 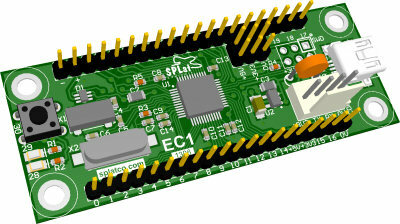 SPLat EC1 isn't better than Arduino, but it is different! Whether or not it's better for you depends on what you want to achieve. Arduino is a fine concept for hobbyists, and has opened up a new world of fun and experimentation for thousands of people all over the world. It is available in many forms, and has hundreds of add-ons available from scores of companies. Arduino is, however, a hobby product, and not intended for professional use embedded in a commercially sold product. SPLat is the ideal concept for professional equipment makers who want a cost effective, reliable and robust control solution for their product. It is available in a range of off-the-shelf industrial strength products. We can also tailor make a custom SPLat for you, at a very affordable NRE (Non Recurring Engineering) cost (think payback in less than 100 units compared to using a traditional PLC). If you start out a control system development with an Arduino, you will likely end up with a cobbled together collection of separate boards, maybe even plug-in bread boards with loose components, before you have a complete system. Exactly the same thing will happen with the EC1. However, with EC1 the cobbled together collection of miscellaneous boards is the starting point, not the end point of your journey. Because the EC1 is a SPLat, it is the first step along the way to a fully integrated, professional quality controller. You can explore your creativity for less than $30, with the comfort of knowing that you have a clear path to an industrial grade controller system, with full factory backing, and regulatory approvals. If you are looking for a very low cost entry point, but want to be sure the path you take leads to an industrial grade, fully supported, economical solution, the EC1 is your ideal starting point. We provide full service support for our industrial grade and custom products. That means we can provide you whatever assistance you need, be it a bit of a leg up with programming, or a full turnkey service, with needs analysis, design, programming, regulatory approvals and after sales repair. Would you rather have a team of professionals behind you and your product, or rely on well meaning, but maybe not well experienced hobbyists on a forum? 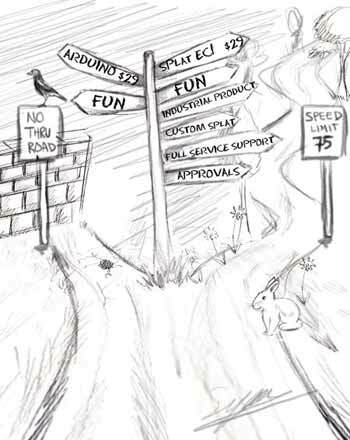 I honestly love SPLat boards much better than Arduino because of your simplicity and more broad spectrum of uses, as apposed to Arduino were everything is specific to one or two functions. The EC1 for example can drive motors, servos, touch screens, it's bluetooth compatible, it can use Xwire to be a master or slave to another board, it can run 64 processes at once, it's small, it's got on board LEDs and button, it's power efficient and most of all it's easy to program. The major reason I don't like arduino is because it uses C++, and I know C++ is supposed to be simple but I never really got the hang of it. If there is one thing we have learned from 32+ years in the electronic controls business, and 16 years of making user programmable controls, it is that the initial out-of-the-box user experience is vitally important. This is particularly true when the user is new to the field. There is a lot to learn, and it's really important to get an assured result early. The first tiny step is vital. Order your EC1 from us. Why not get a couple? (Advisable) Order some female-female jumper leads and female-male jumper leads. Suggested source. Note that the EC1 has male pins, requiring female jumpers, which is opposite to the Arduino. (Optional) Order one or more solderless breadboard. Suggested source. These are great for connecting together a few components. 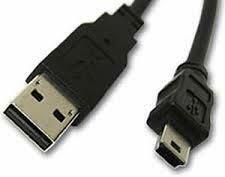 Make sure you have a USB mini-B cable to connect your computer to the EC1. Notice the small connector has obvious "dents" on either side. Wait impatiently for the EC1 to arrive. Explore more EasySteps to get you going quickly.